How do children with Autism and/or Learning Disabilities described by their families using words like “loving, kind, caring, funny, gentle giant, sense of humour, makes me laugh” end up in crisis and within the setting of an Assessment and Treatment Unit? What are the Challenges in the System? We brought families together and asked them. Long processes regarding complaints and having to jump through too many hoops with little support for families already drained by their personal experiences. Some families experienced bias and inconsistency regarding how issues were documented. One described their loved one who has learning difficulties speaking extensively at their CTR about something that was of huge concern to him, yet none of this was minuted. Families often felt that they were seen as part of the problem, rather than part of the way forward, and so not listened to as a result. Follow the NICE guidelines, the NHS England recommendations and other such guidance available. The CTR report should have a timescale attached to it for actions contained in the report. These timescales are currently determined by the team, families ask that they remember there are vulnerable children and young people involved and three months can seem a very long time to a family in crisis. Providers should be accountable for actions generated through CTR and external scrutiny is needed to ensure these are completed. Many families felt that medication was introduced often in the first instance and not, as NICE guidelines recommend, as a last resort following interventions which were developmentally based and person-centred. The Responsible Clinician – often the Psychiatrist – was viewed as having too much power and parents often felt not listened to when it came to views on medication. Most felt that medications were over-used and at too high dosages. Some felt that medication was being used as a restraint (inappropriate) and needed more careful monitoring and reviews. Parents wanted support to challenge this use of the ‘chemical cosh’ which goes against NICE guidelines. Some said that their young people had never experienced medication until they entered an ATU. Medication being used as restraint and as a punishment. Many parents voiced serious concerns regarding the forms of restraint used, particularly around prone restraint, which some said should be banned as an inhumane practice. Various concerns regarding the nature of the agencies offering these assessment and treatment models. Many mentioned a consistent sense of underpaid and under-trained agency staff, working in organisations driven primarily by profit. The whole funding process was seen as being complex and opaque, with little sense of who was accountable. A serious inconsistency around the following of care plans; communicating with families on issues and challenges; training on routines, behaviours, Makaton etc. then parents having to pay for their own travel costs to see them for often very short periods of time. If a decision is made that, as a last resort, someone with a learning disability needs to be detained under the MHA a long way from their family. Provision must be made for the family to have their costs for regular visits recompensed in an easy and timely way. Individuals leave hospital with a lack of a personal budget or financial control due to the heavy focus on a placement and the step down pathway. Lack of action by Local Authorities to set up support ready for discharge. Some young people missed the staff and familiarity of the ATU, with no thought given to these kind of transition issues. Funding around housing etc. takes months. Independent person to set up local services. A list of local providers, vetted by parents would be useful. The added major complexity of bringing the young person home suffering from post-traumatic stress, mental health issues and physical health problems due to the time spent in ATU and impact of medication. Nothing in the community once the young person is home. Potential providers need to be sent a very clear and detailed pen picture together with a Person Centred Plan. Only assessed if 100% sure that needs can be met. Too many assessments are unsettling. 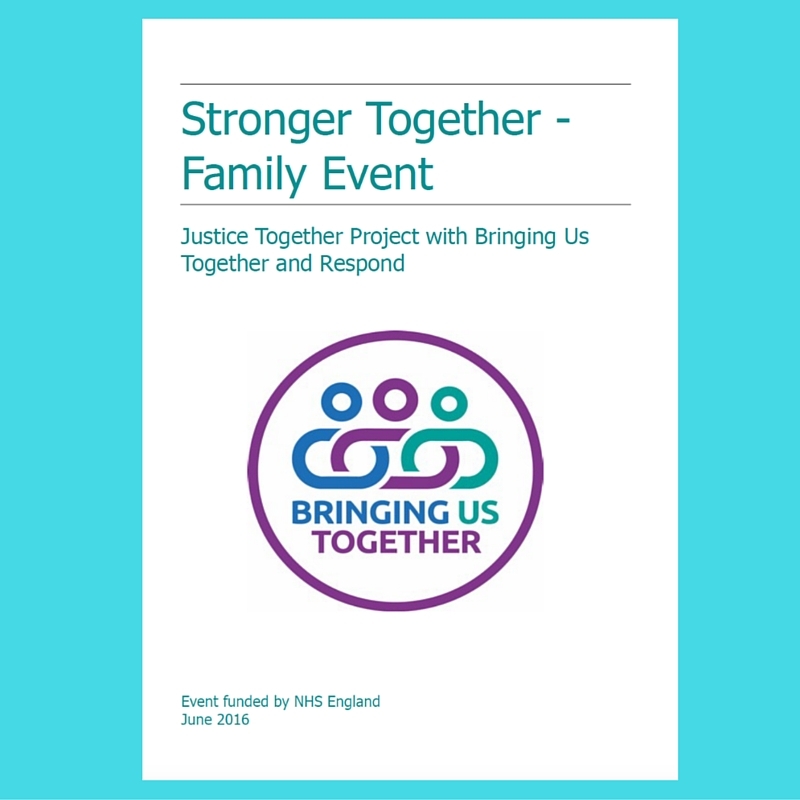 Stronger Together: This is a report from our weekend with families. It talks about what families thought the issues were, it also looks at the possible solutions and recommendations from families.